It’s my birthday, so go ahead and take this opportunity to celebrate the day of my birth in any way you wish! And don’t forget my twin; it’s Sarah’s birthday too! I want to give you a recap of my Portland to Coast experience, but I also want to share the more intimate inner workings of my mind when it comes to my philosophy on running/walking. 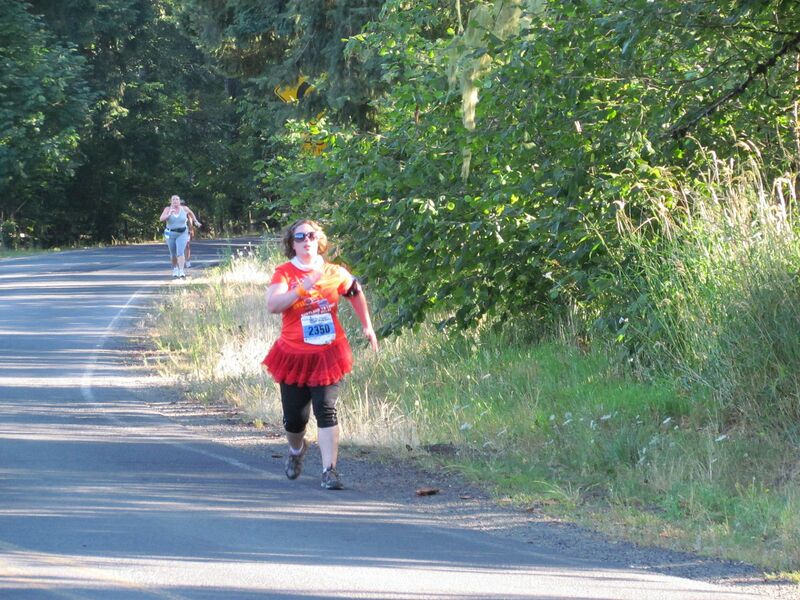 The 2011 Portland to Coast Relay Walk was exhilarating and terrifying! (I have not built up the nerve to the full Hood to Coast Run yet, but I’m working on it.) This year was my sophomore year as a part of a speed-walking team. I was a little apprehensive before the event began. There were a lot of unknowns on my team—I had never met three of my new teammates, who would be squished in a Suburban with me for 30 hours. As Captain, I had made every effort to communicate with them, to make everyone feel at ease with the journey to come, and to let them know I had everything covered. Only I didn’t feel like my efforts were much appreciated. Most of my brain knows that just because some of my team members didn’t respond to my (well-written and thoughtfully-crafted) emails, it doesn’t mean they weren’t read. Being a Virgo, I wanted immediate responses from each recipient upon receipt of every email. Ok…I’m being a little facetious here…but I wanted to be assured that my efforts were being acknowledged, and also that I wouldn’t have to read all the rules and regulations to the team once we’d all gotten together. There are a lot of things to remember in this event, and I knew we’d be busy enough with the task at hand. Can you tell I put a lot of pressure on myself when it comes to things like this? Have you ever been in charge of something and be absolutely terrified that things will fall apart, and everyone will turn and blame you because you stupidly volunteered to be Captain and Team Scapegoat? I have those fears. I bet a lot of us do. My chest tightens just thinking about it. I must remember to breathe. In the end things went pretty well. They definitely weren’t perfect, but we didn’t forget any supplies, we never missed the baton handoff, and no one injured themselves, aside from the usual muscle aches. While observing hilarious costumes and team names, I also noticed was that there was so much love and support coming from everyone in the event. Yes, my teammates cheered me on when I killed that 8 mile leg in record time, but in addition to that, many strangers rooted for me as I passed their vans, stood beside them in the 2:00 AM chill, and moaned about the lack of sleep with them. I felt such a kinship with the thousands of people walking and running beside me, all of us reaching for our best selves. That feeling is like a song that makes me fill up with joy every time I hear it. The one that comes into my head right now is “Iwoya” by Angelique Kidjo and Dave Matthews. Whether or not you like or understand the music, you can’t not be happy when you hear it. I feel this song gives the listener a gift of love with every play. And that is exactly how I feel about running and walking. It’s a gift I’m giving my body, and it always makes me happy. I have never said to myself after a run, “I wish I hadn’t done that!” I love running…and I hate it too. It makes my chest burn, my legs ache, and my everything sweat. But the most commanding feeling I have about it is that it makes me feel like a total rock star. I have never been so proud of myself as a physical being. Besides bellydance, no other activity has ever made me feel so alive. I also recognize that it’s starting to make a serious impact on my body. I’ve gone from hating my body to embracing it, thanking the Universe every day that I am able to do these things, and do them well. I wish that everyone will find their love of life the way I have. It’s a beautiful thing. ← Quickpost—Read Oregonlive's Spotlight on Urban Gardening! Thank you Jeanette! I love your warm and always-positive comments.